John Chirwa is one of Temwa’s longest standing beneficiaries. Based in Kasasire, Nkhata Bay North, 20km in land from Lake Malawi, he lives amongst vast areas of forest. However, these areas are under threat. Deforestation is a problem across the region and forest cover in Malawi generally has fallen from 41% to 34% since 1990. In and around Kasasire, wood is the main source of fuel and as a result, felling trees and cutting them up for charcoal is a common practice. The loss of trees in the area has, in turn, had a negative impact on soil fertility as the topsoil becomes exposed to rainfall making it more difficult to cultivate crops. John wanted to help with the reforestation of the area and so became a part of Temwa’s efforts to combat deforestation, facilitate community stewardship of forest management, and promote fair and sustainable access to forest resources. As a member of a Village Natural Resource Management Committee (VNRMC), John is a part of a wide network of 47 committees across the district working with Temwa to oversee the reforestation of the area. 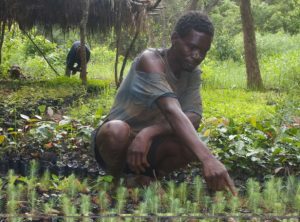 In 2015/16, the committees led the planting of 90,000 trees through the Nkhata Bay Natural Way (NBNW) project, run in partnership with the International Tree Foundation. John is one of 3,300 beneficiaries on the NBNW project, each of whom are moving towards improved food and income security as well as taking steps towards improving the environment around them. In the coming year, we hope to be able to continue to support communities in Nkhata Bay North by expanding our tree planting and climate sensitisation training. If you would like to support our forest-friendly projects in Malawi, consider donating or fundraising for us.